Playing on modern Scandinavian design, the Kensal Set of 2 Bar Stools are an appealing addition to any kitchen or living space. Match it with the Bowen Bar Table as seen here for the complete look. Minimalist design doesn't mean sacrificing on comfort, and with a gently curved seat and backrest, the Kensal Bar Stool is as supportive as it is stylish. The Kensal Bar Stools have a contemporary and effortless sense of elegance, with a design that makes it easy to work them into any living space. 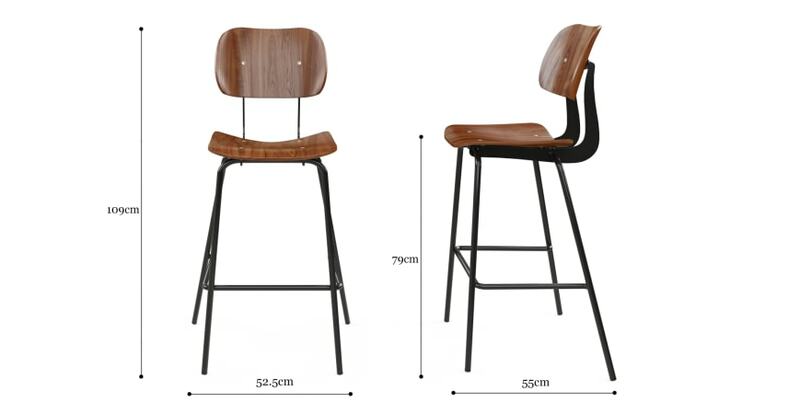 See also the Kensal 2x Dining Chair from the same chic range. Constructed from high quality, durable materials including veneered Engineered Wood and black Powder Coated steel, the bar stools are an adaptable and sturdy pair.